Megali Ammos beach is very close to Mykonos Town, you can go even on foot in just ten minutes, which is why is one of the first beaches in Mykonos that have been developed in tourism. It is a sandy, beautiful beach and therefore took it’s name because before the construction of the road the sand reached up to the top of the hills. There was a myth saying that the Megali Ammos beach was haunted by the ghost of the pirate Kapetanaki, but in fact this myth invented by some captains in order to keep away people – and particularly the locals – so they can unload their goods quietly at night with their boats, especially during periods of the war. 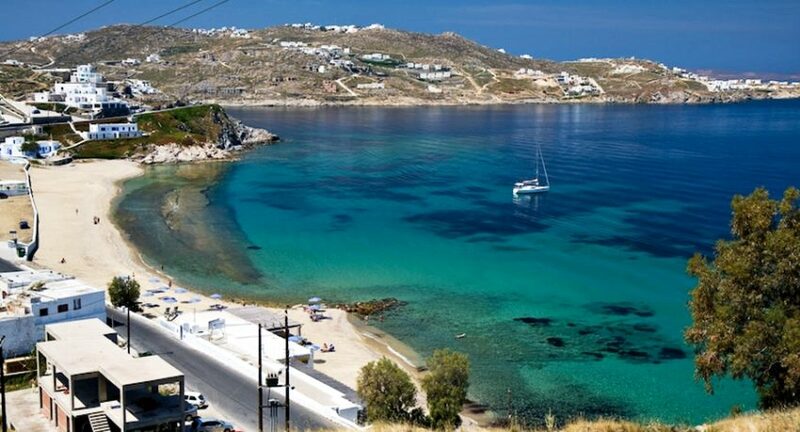 Megali Ammos beach is not organized, you will not find umbrellas and sunbeds, because of the northern winds that often blow in Mykonos, however you will find many hotels and apartments, as well as a tavern with very good food and recipes from the Greek and Mediterranean cuisine. The hospitable owners will take care of you and make you feel welcomed, while you will enjoy the magnificent view of the famous windmills, Tinos, Syros and Delos. This beach is among the most inappropriate beaches for water sports, such as windsurfing and snorkelling. Instead, you should be very careful when you swim, because the main feature on this beach is that there is a very large plate to the bottom. Megali Ammos beach is also a good choice for a horse riding in the sand from the riding school located there. Despite being so close to Mykonos town, the beach is very peaceful and with crystal waters, which is why is recommended for relaxation and tranquility, but also to admire the sunset, and when you will want to continue your entertainment, you will be only ten minutes away from the center of Mykonos.